Today, SatoshiLabs and the NEM.io Foundation are happy to announce the launch of TREZOR integration into the NEM NanoWallet, enabling you to secure your NEM assets with the help of the world’s first hardware wallet. XEM, the currently 9th cryptocurrency according to CoinMarketCap.com, becomes the 12th officially supported cryptocurrency in TREZOR. Along with providing support form XEM, TREZOR can also offer support for assets built on the NEM blockchain. Tokens on the NEM blockchain will therefor also be supported, as are other assets created on this blockchain. For more details, please refer to the press release by NEM.io Foundation. You can also learn more about this cryptocurrency at this link. Start using NEM with TREZOR! 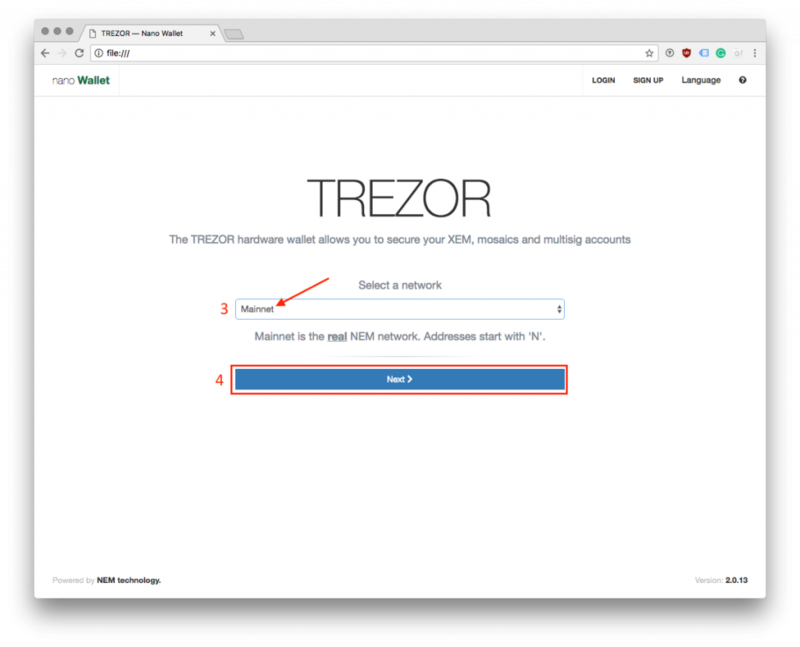 This guide assumes that your TREZOR has already been initialized — you have set up a TREZOR before, and you have your recovery seed. If you have an entirely new device, please go to TREZOR Wallet first and set up your device. First of all, please make sure that your TREZOR device is running firmware version 1.6.0. If you have not yet updated the firmware, go to TREZOR Wallet, and follow the guide. After the process is done, go to nem.io/downloads and download the Universal Client of Nano Wallet, which is a simple web interface for NEM. Extract the zip file and start the application or web-page. (In this guide, we are using the Universal Client together with Chrome.) You will be greeted with the simple and clean NanoWallet interface. Next, click on Login in the upper right corner and, in the next window, select Login with TREZOR. Confirm the Mainnet selection and click on Next. A TREZOR Connect pop-up will appear. 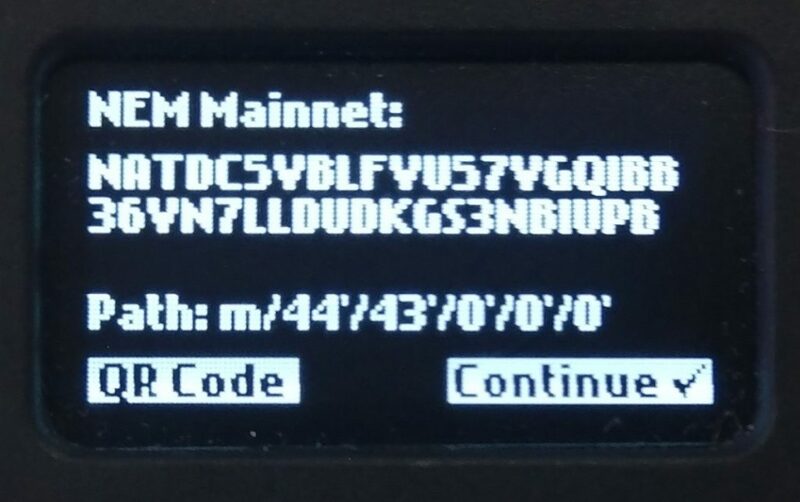 Please confirm NEM address export, and unlock your TREZOR with your PIN (and passphrase, if enabled). 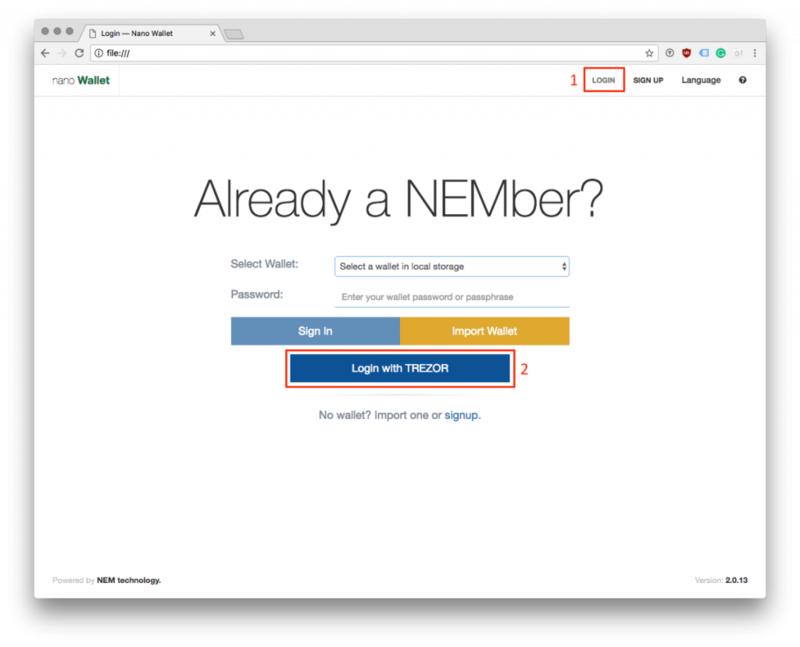 The TREZOR device will now show your NEM address for your account. In our case, it is the Account #1. (Below the address, you can see its derivation path.) Continue the process by clicking on the corresponding button on the device. Welcome to your NEM wallet. NEM is the name of the blockchain, XEM is the name of the cryptocurrency. NEM also features other assets, such as tokens, built on top of its blockchain. 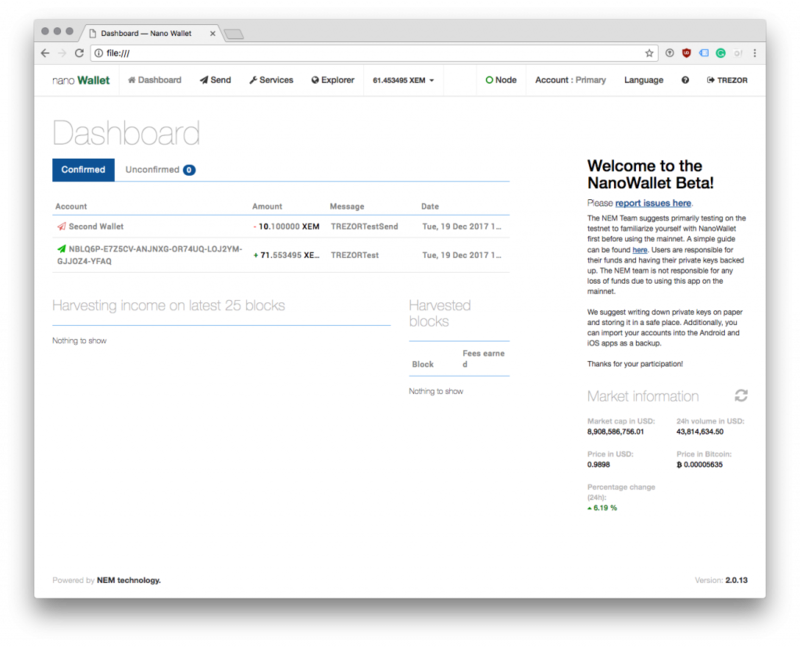 After unlocking your wallet with TREZOR, you will be brought to the dashboard of NanoWallet. Here, you will be able to see all your transactions sent from and to your TREZOR device. On the right side of the screen, you can see detailed information about the market status of XEM. Your account balance is shown in the middle of the top menu. Now, let’s load your XEM account. Click on the Account button in the top bar to get to your account info page. The first entry in account information is your account address. Unlike Bitcoin, in NEM you will only have one address per account. To verify this address, click on Show on TREZOR button. If the address shown on your device matches the address in the web browser, it is genuine. Always trust the address generated by the device over an address shown in the browser window. First, open the send dialogue by clicking on the Send button in the top menu. 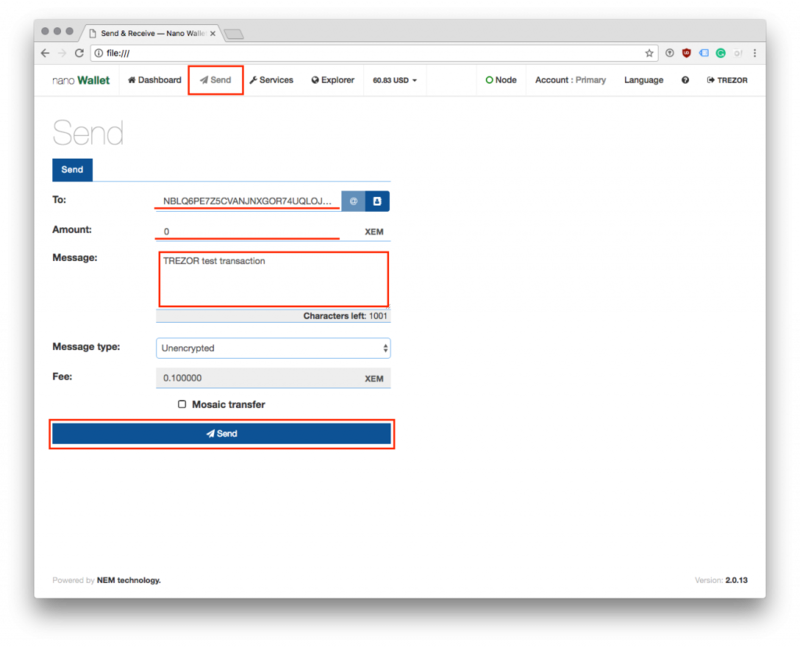 Fill out all required fields, such as the receive address, the amount and optionally the message, which you would like to attach to the transaction. When finished, click on send. 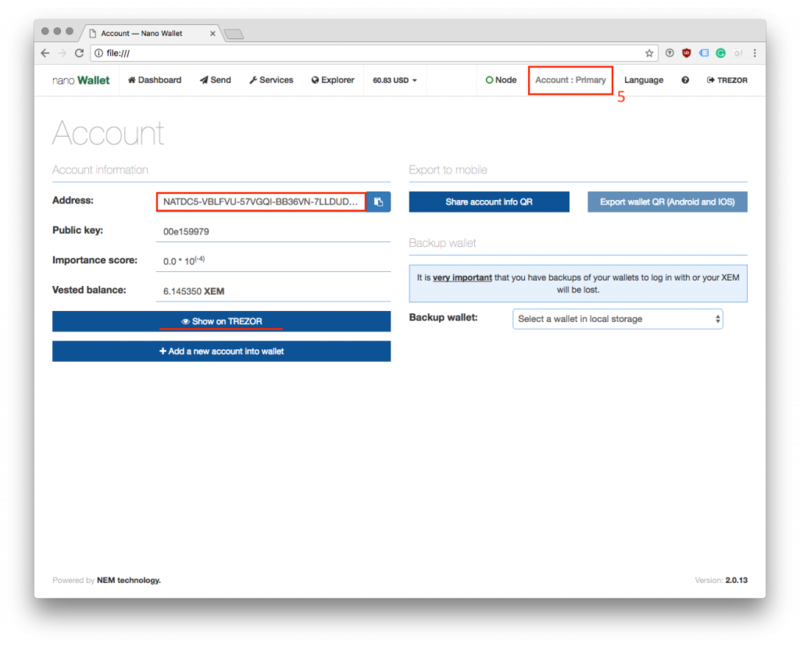 After creating and confirming the transaction in the web interface, the data are sent to the TREZOR. Now, verify all the transaction details on the device. First, you will see the amount. Click Next to continue. Then, you will see the message attached. If it is correct, click on Next to continue. On the last screen, you are verifying the address. If it is indeed the target recipient, approve and sign the transaction by clicking on Confirm. That is it! The transaction is sent. You can return to the dashboard to check the outgoing transaction. At the end of the day, if you want to lock your wallet, click on the Exit button in the upper right corner of the wallet. As your private keys are securely stored on your TREZOR, this only stops any eager eye from seeing your account details. Even if you forget to log out at the end of your session, a malicious actor on your computer would only be able to see your balance and your address. Nothing more. They definitely won’t be able to steal your XEMs. That is it! You can store your XEM and other NEM assets safely on TREZOR starting today! Hope this guide has helped you! 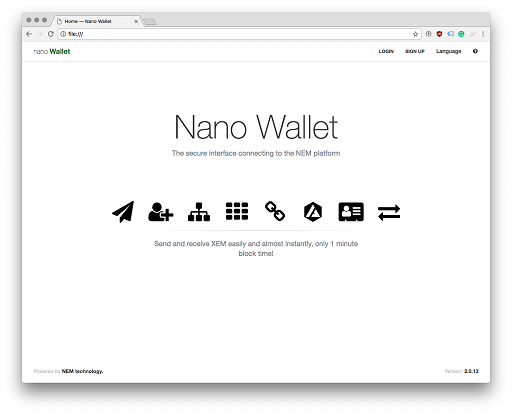 If you need more information regarding the advanced features, please consult the NanoWallet tutorial at nem.io. Just remember that whenever you are asked for password, private key, or brainwallet, you should use your TREZOR instead! TREZOR One is the most trusted and ubiquitous hardware wallet in the world. It offers an unmatched security for cryptocurrencies, password management, Second Factor, while maintaining an absolute ease-of-use, whether you are a security expert or a brand new user.